‘Mantra Changes Lives’ is our initiative to work with charities and not-for-profit organisations, to create jewellery to raise funds, show support, and build awareness for important causes. We partner with charities that we believe are working hard to make the world a better place. We create a mantra that links to their cause, and then design a beautiful piece of jewellery to bring it to life. 25% of the selling price of the jewellery is donated to the charity, with every sale. Our latest partnership is with ModernMuse, a charity dedicated to smashing barriers for young women in education, to open their eyes and their ambitions to all the diverse opportunities in the world of work. The purpose behind Modern Muse is to open every young girl’s eyes to the breadth of opportunity out there, and introduce her to role models who demonstrate that achieving success in the workplace is within reach of everyone, including her. It is about informing, inspiring, connecting and empowering every girl, to help her embark on her career journey in the belief that she can achieve anything she sets her mind to. In order to create a perfect necklace for Modern Muse, we wanted to work with some of their Youth Ambassadors - bringing to life their philosophy of being led by girls, for girls. 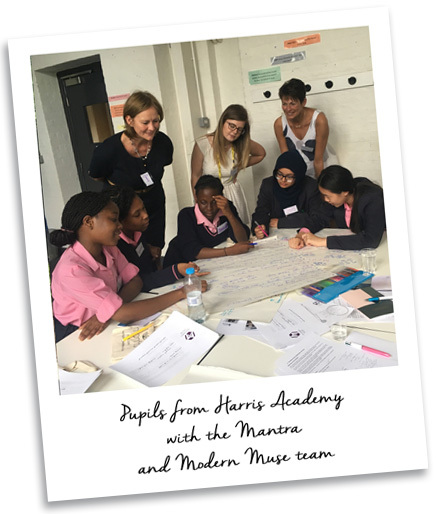 Hosted by Donna Robertson of Modern Muse and sponsor teacher Pavandeep Aujla, we assembled a group of Youth Ambassadors from the Harris Academy in Bermondsey, in early July. We took them through an overview of product design and development for Mantra. We explained the objectives of the project, and talked in detail about what a ‘mantra’ is, and what the objectives of the collaboration are. We then held a structured brainstorm with the girls, to create ideas for the ‘Modern Muse’ necklace. 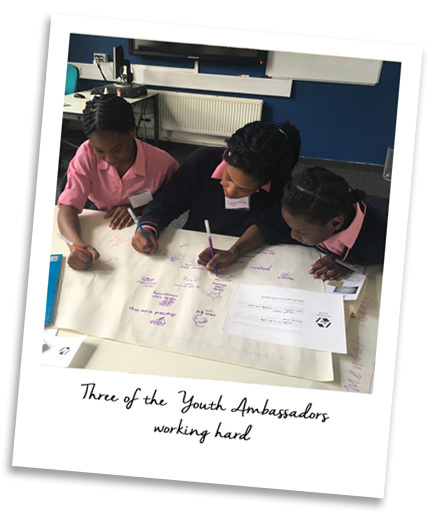 The Youth Ambassadors split into three groups, and each discussed the pressures that they and their friends feel, as young women in education, and young women growing up. They talked about lack of confidence; pressure from social media; feelings of isolation and loneliness that can develop; their anxieties, vulnerabilities and insecurities. Then they went on to discuss how they want to feel, and what they need in order to feel that way. They talked about encouragement, strength, confidence, and wisdom; they talked about family, friendship and connectivity; about growth, resilience, and wanting to go beyond; and they discussed being yourself, standing out as an individual, not judging others, and being proud of who you are. As the girls talked, phrases started to emerge, which began to capture some of the words of encouragement they were drawn to. ‘Never stop blossoming’, ‘I am me, I am proud, I am powerful’, ‘I can and I will’, ‘Keep your head high’, ‘Be you’, ‘Why try to fit in when you stand out?’, ‘Though I am young, I am wise’, ‘Go beyond infinity’ and many more made it onto the flipcharts. 4. Ideas around inner wisdom and values, and not judging by outward appearances. With further discussion, the group decided that they wanted to focus on the theme of individuality, combined with strength and confidence. One of the groups had written down, ‘Find your melody, sing your tune’, in the idea-generation stages of the brainstorm. 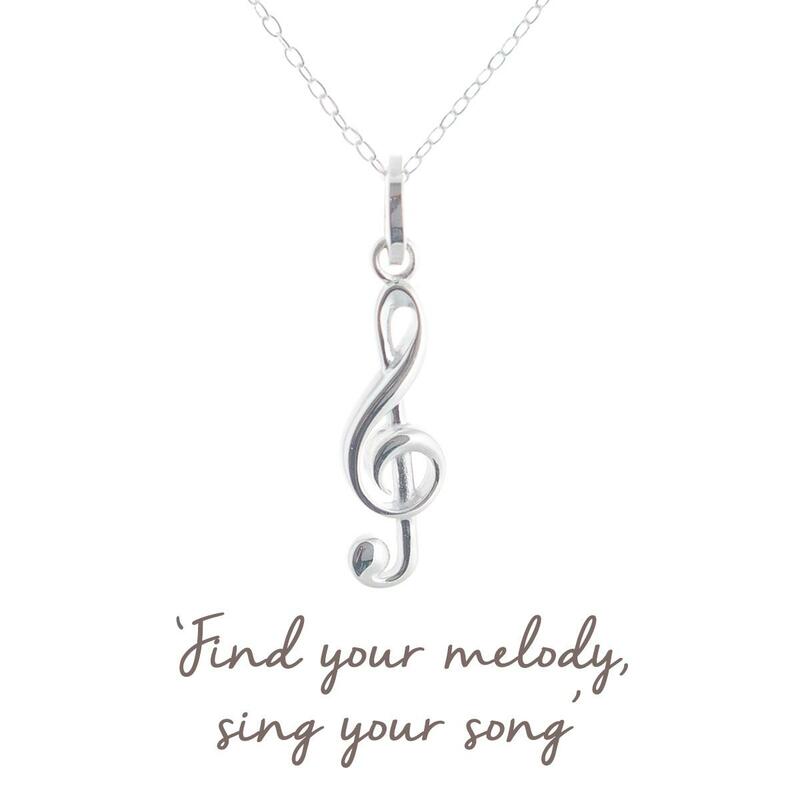 ‘Find your melody’ encourages each girl to be an individual. A melody is the outcome of a series of notes, but it comprises so many diverse elements – pitch, duration, rhythm, speed, loudness – that there are many, many different outcomes that can be created by combining these elements differently. The second part of the phrase, ‘sing your tune’, was refined in further discussion to ‘sing your song’. ‘Sing your song’ is a call to action, requiring confidence and courage to go out there into the world and let others hear what you have to say. So, we finalised the mantra to be, ‘Find your melody, sing your song’. Having arrived at a clear message that all the girls liked, we then discussed what design could represent this best, as a piece of jewellery. The girls liked the idea of an elaborate music note, such as a treble clef. Our next stage was to go away to draw up some designs incorporating music notes, and / or words, and we're proud to unveil the finished design! When you buy one of our ‘Modern Muse’ necklaces, to inspire yourself, or as a gift for your daughter or a young colleague, 25% of the price goes to support Modern Muse and their inspiring work. Help us to change young women’s lives. Find out more about Modern Muse here – www.modernmuse.org (Registered charity number 1171843).